Nestled in the verdant, tropical rainforest of Kamala, the award winning Keemala is a wonderfully tranquil resort that encourages wellbeing and embraces the cultural way of life. 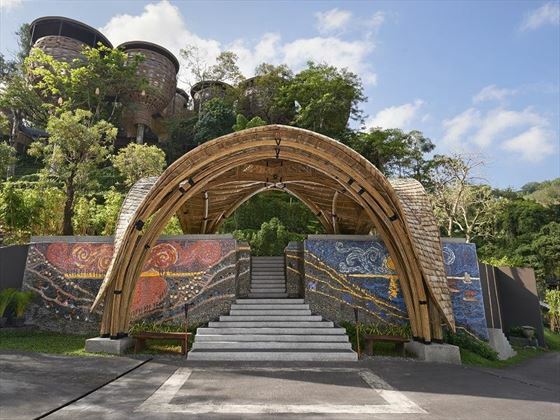 This enchanting resort is inspired by the culture of four fictitious Phuket tribes: Pa-Ta-Pea (Earth), Khon-Jorn (Wanderers), We-Ha (Sky), and Rung-Nok (Nest), using these philosophies to create a harmonious blend of culture, health, and relaxation. 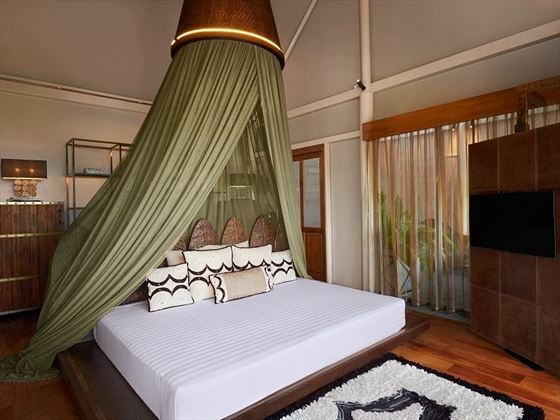 Close-by to Kamala and Patong Beach, you’ll be close enough to the livelier side of Phuket’s lifestyle should you wish to explore, but the hotel’s secluded location within the trees offers an intimate and quiet atmosphere. 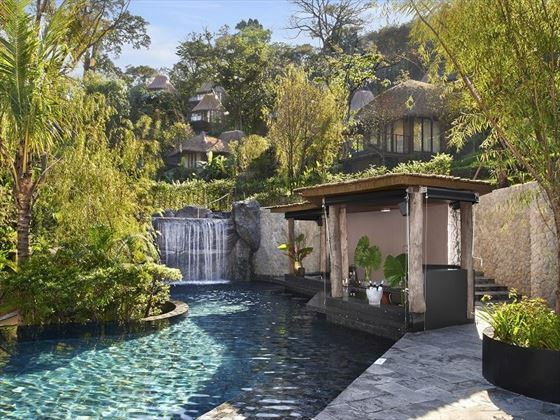 Each villa features its own pool, hidden in the exotic flora and residing either amongst the forest floor, or high up in the canopies. 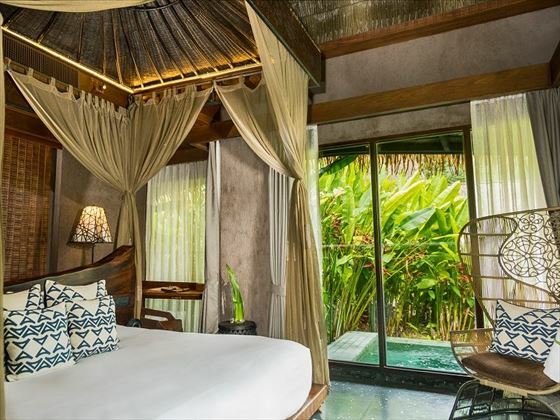 All four villa categories are inspired by the main Phuket tribes, using each philosophy to create a new personality and experience, varying from the earthy décor of the Clay Pool Cottages, to the suspended furniture and unique shape of the Tree Pool Houses. Designed for guests to fully unwind and find peace, the facilities here add to the peaceful ambience, looking to relax you and improve your wellbeing. Venture to the Mala Spa for a treatment that incorporates the elements of earth, fire, ocean, air and ether, or take advantage of the complimentary fitness schedule, which includes jungle treks and beach walks. 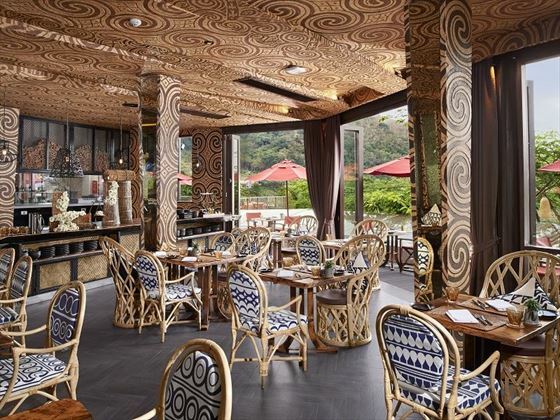 The restaurants here are wholesome too, serving local and international cuisines, with wonderful backdrops of the rainforest and the sea. A member of Small Luxury Hotels of the World, we're proud to recommend this to travellers who are looking for a gorgeous boutique experience. 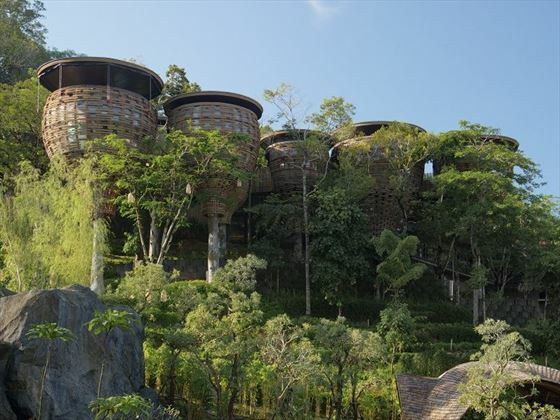 The resort is secluded and intimate, nestled in the luscious rainforest of Kamala in Phuket. Overlooking Kamala Village and the Andaman Sea, the resort is close by to the lively Kamala Beach, but set back enough to offer guests a tranquil, rejuvenating ambience that promotes wellbeing. Clay Pool Cottages – These wonderful 126sqm cottages are inspired by the Pa-Ta-Pea Clan (Earth), who consisted of farmers, fisherman, and gardeners. A connection to the earth bought them many health benefits, and so the décor and ambience reflect the earthiness of the landscape to create a tranquil retreat. 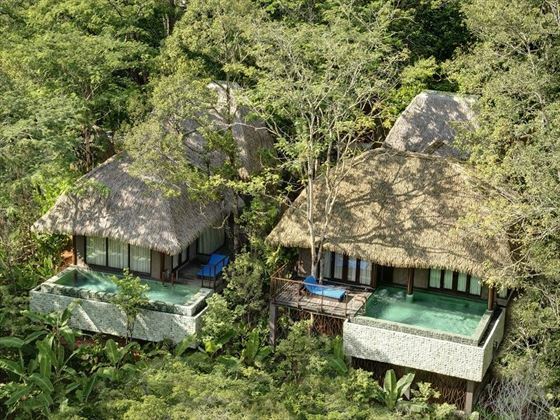 Hidden in the trees, these cottages offer a private pool and terrace with rainforest and resort views. There are 14 one bedroom cottages with a king size bed, and two two-bedroom cottages offering 180sqm of space and one large shared bathroom. 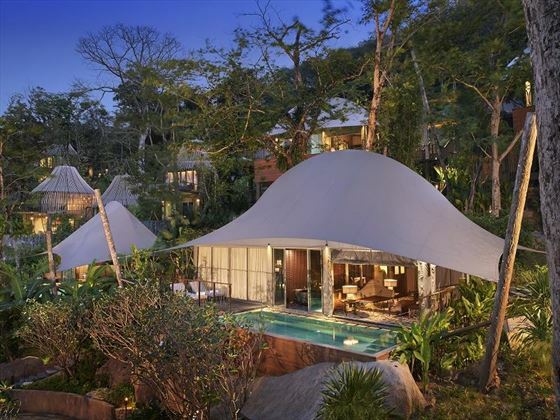 Tent Pool Villas – Inspired by the adventurous Khon-Jorn Clan (Wanderer), who would construct semi-permanent homes so they could keep moving on to explore, these seven incredible 140sqm villas are covered by a tent-like roof, with décor inspired by wildlife and nature. 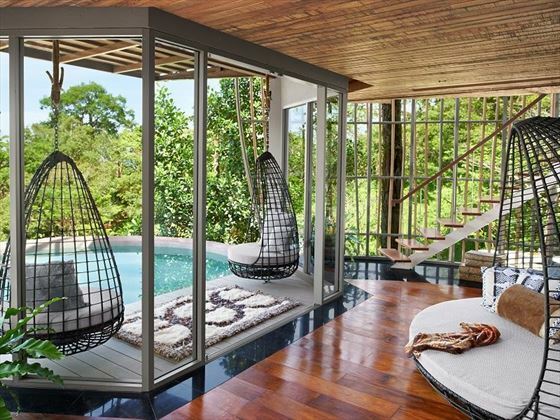 These villas also have larger 30sqm private pools, and spectacular views of the rainforest and resort. 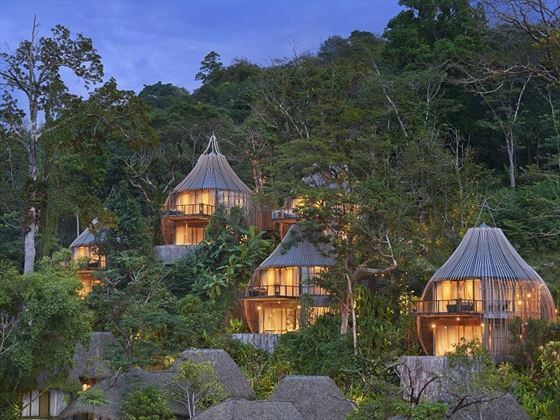 Tree Pool Houses – The We-ha Clan (Sky) built their homes high up from the ground in order to acquire creativity, and so these seven impressive 169sqm villas are hidden in the luscious tree canopies and adopt a truly unique design that looks as if they’re suspended from the trees. With a tear-drop shape, these villas feature two floors – the top floor has a master bedroom and an outdoor relaxation space, whilst downstairs is home to a lounge that can be converted to sleep another two guests. Inspired by the sky clan, the décor includes suspended furniture and cocoon like beds. Bird’s Nest Pool Villas – These 185sqm villas are inspired by the opulent Rung-Nok Clan (Nest), consisting of artists, musicians and philosophers who lived a more luxurious lifestyle. The clan kept themselves secluded, hence the bird’s nest inspired exterior of these intimate villas. 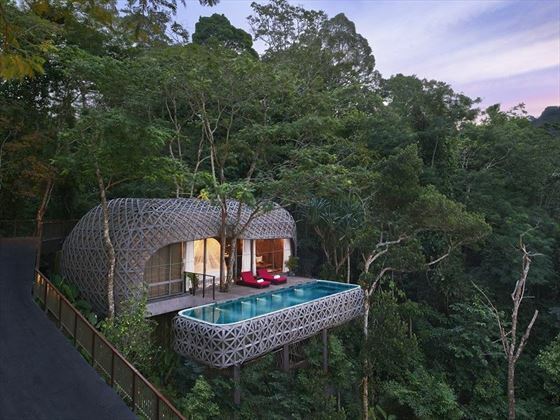 Nestled high in the trees, these villas offer sea or rainforest views from its spacious sun deck and private pool. Mala Restaurant – The main restaurant, offering wholesome food for breakfast, lunch and dinner. For a revitalising coffee or a refreshing cocktail, venture to the restaurant's trendy open-air bar, open until the last guest leaves. Cha-La – A delightful poolside restaurant serving refreshing drinks and snacks. Lounge Area - A laidback spot to tuck into a delightful afternoon tea. Wine Cellar - A stylish and cosy wine cellar perfect for an intimate dinner for two. Destination Dining - Indulge in a romantic meal for two around the resort, or enjoy your very own barbecue or picnic basket. In-Villa Dining – Enjoy personalised dining at any time of the day, right in the comfort of your villa. The resort is a short distance away from Kamala Beach and Patong Beach. 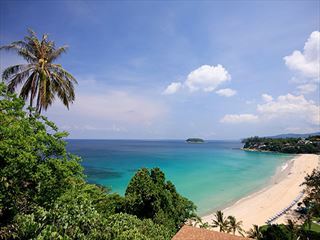 The resort offers complimentary transfers to Kamala Beach. Mala Spa – Combining healing treatments for the mind, body and soul with modern pampering and salon treatments, this beautiful holistic spa will truly rejuvenate and revitalise the senses. With plenty of calming treatments, including massages, anti-aging skin facials and Reiki – an effective method of energy healing – you’ll be sure to feel relaxed in this tranquil sanctuary. All therapies incorporate the elements of earth, fire, ocean, air and ether, and there are eight spacious treatment rooms, a sauna, steam room, aromatherapy bath, and rain showers. Be sure to take a dip in the ozone-filtered pool too, and try out the holistic fitness centre. This resort is not suitable for children under 16 years. 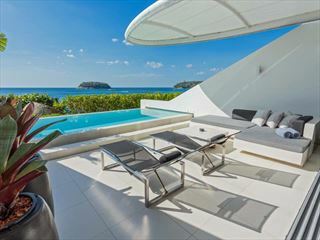 Luxurious and elegant, The Shore at Katathani boasts a prime location on the secluded Kata Noi Beach in Phuket. Perfect for a couples break, the tranquil and pampering nature of this resort makes it ideal for a romantic escape. 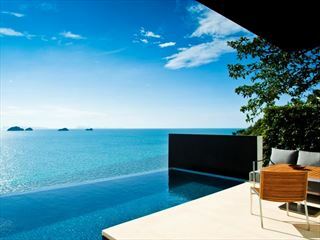 A hidden gem of luxury, the gorgeous Kata Rocks Residence and Resort is one of the finest in Thailand. 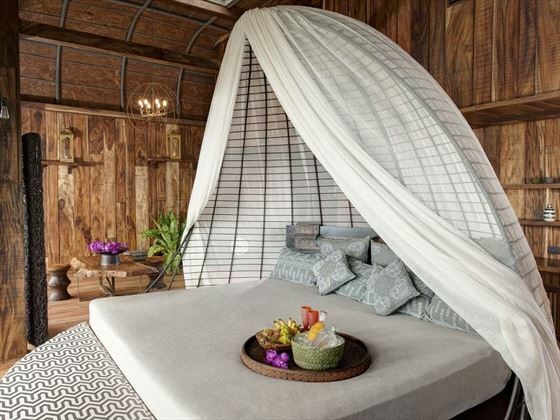 Impeccable service, rooms with stunning views and a stones throw away from one of Phukets finest beaches. This hotel deserves its place in our platinum collection. This a beautiful haven for those wanting absolute privacy. Set into a secluded hillside with stunning views across the Gulf of Thailand, you'll experience some of the best sunsets on the island in the most luxurious of settings.